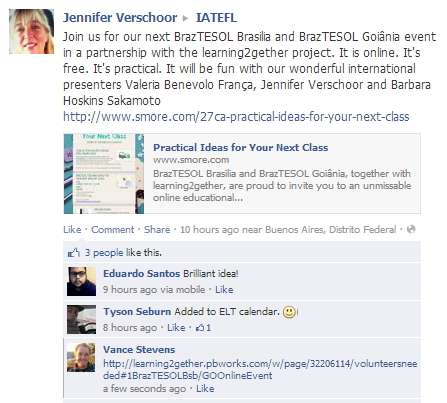 BrazTESOL Brasilia and BrazTESOL Goiânia special online event for Educators with Jennifer Verschoor, Valéria França and Barbara Sakamoto as presenters. Nice to see you Barbara!! I used to promote Let’s Go all over Brazil for OUP! Great book, barbara! Hi Carla! Thanks for arranging this awesome program! Peggy, thank you for being here! JALT & Let’s Go! Baby! Barb I am a huge fan of your work. not to mention the cost! Honey, I shrunk the Barbara! Sweatshirt and pajamas. It’s cold! All of the above! Yummy! A side salad for Isabela, please. I’m eating chicken right now! It can be done with flash cards, realia, google images… nice! Put the ~ on the plate is fun, too. Good to see you too, Graeme! Thanks for your help, Carla! surely no right or wrong answer, though! whatever works in Ss minds? grapes and iguanas are green? How do you ask “How many categories?” without using the L1? things I like and things I don’t! Yay! PEggy! separated at birth? Love ya Barb, gotta go! They are each “a pair”. things kids use more than adults! Of course the answer to life the universe and everything is 42! I’ve met a scientist who broke a window at the library!!!! at what age do the kids make the transition from knowing the “real” object to realizing the picture represents the object? hmmm… good question, Peggy… surely before 3! barber shops are a dying breed, aren’t they? More like unisex hair salons these dasy! An astronaut called the barber shop on his mobile to book the next haircut. An astronaut took a cell phone to the barber shop. The barber told a story about an astronaut while cutting the hair until the cell phone rang. An astronaut ate a cell phone at the barber shop. The barber shop owner told his wife on the cell phone that he REALLy wanted to be an astronaut! Barbara how should we treat the missing prepositions/articles in their production? ok, I understand, thank you. Yay! Willy! Glad you could join us, mate! A scientist saw a monkey at the zoo. At the zoo, the scientist transformed himself into a monkey! The monkey was scared to see the scientist at the zoo. Da Vinci invented the TV but decided to throw it in the volcano Vesuviius! Mona Lisa was really a cute soccer Mom who used to get hit on at the soccer field! haha… but since they were on strike it took a while! really nice ideas, Barbara! Thanks so much! Adorable indeed! Kid will love it! yes, Peggy, true! 🙂 My students need more of those activities… I guess. I’ll try it this next week! I’m sure it will make a difference in your class, Nina! Nothing better than an achievable challenge for sense of accomplishment! children are naturally egocentric, aren’t they? We can use this to our/their advantage! I think it’s different with older children, though. Maybe they get too self-conscious to talk about themselves? actually… this is also about another person, not strictly their own preferences… so could avoid shyness. Emerging discourse in English. Great. How do you ask kids to group things into categories without using the L1? thanks so much, Barbara… there were some questions above. Thanks Barbara. That was fantastic. Have a bunch of notes to take into my next class. Wonderful ideas Barb. Loved them all! One Q was about grouping items.. in L1 or L2? Thanks for the nice ideas! do you correct on the spot during these activities? Lucia… you can see the whole thing on the link above. Would you use these activities with beginner adutls in japan Barbara? There is much more coming up, Lucia! yes… up next… Jenn from argentina! @Supershaun I’ve used them with high school students. Great to hear, Edmilson. Thanks. Any plans to come to Brazil? Thank you so much! This were great activities and tips. THank you very much for your nice ideas! Glad you made it, Rose! Tks Barbara, I missed your presentation. hmm I like that topic! Tks for the webinar. I’m happy to be here. One of my favourite topics! 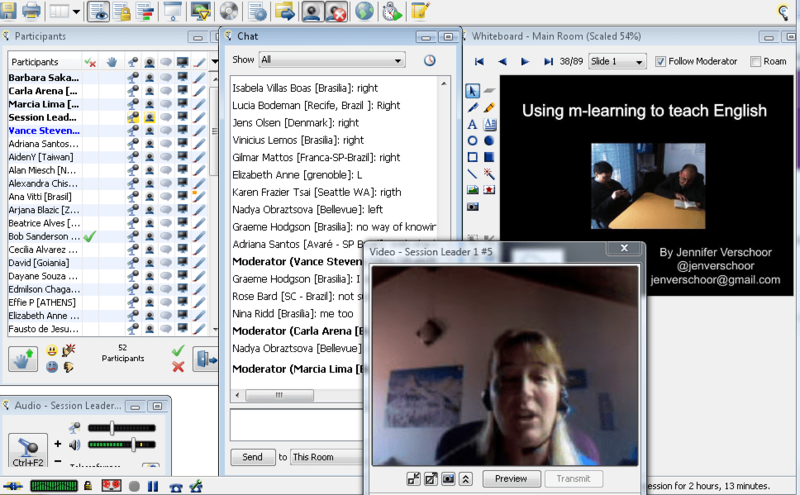 learning with any mobile device, Maria… not just mobile phones! 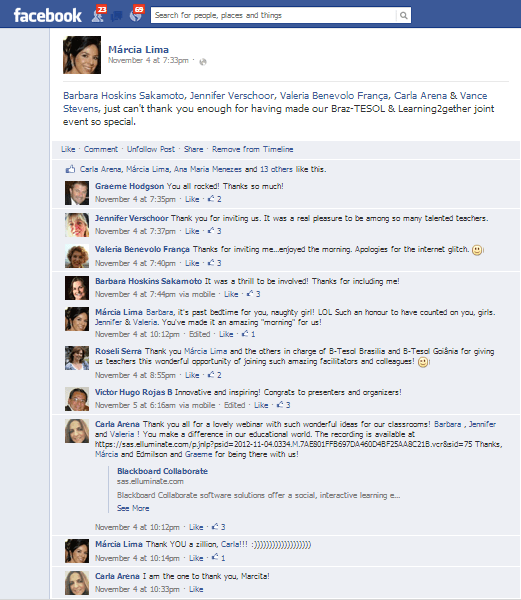 I also presented on this about a week ago… very hot topic that teachers are highly interested in! video ok now 🙂 Hi Jennifer. so much that can be done without internet!! hahaha… kind of, right, Nina? The first time I learned more about it was with him, Graeme Hodgson. I read books and use a phone! not sure. I can’t choose. interesting.. more Blackberries than iphones! yes, mlearning is not about the device, but about mobility! my husband has a mobile phone, what I call a “cumb phone”. once my mind opened up, I can’t do otherwise. I feel a bit lost with my teaching though. Who is speaking at the moment, please? Jen has just started, Nina. where do I get the links after the presentation? I need to learn more about online safety, make parents calm with good arguments. uuuuh! sneak preview! I like it! hahahaha… Yes, i’m THAT old! Miguel… good to see you here! doesn’t the iPod shuffle sound like a dance to you? HI, Jennifer. Woke up a bit too late this morning. Hi Ana Maria!!!! Pity I missed you on my last visit to uberlandia! David Crystal says this is fine and not damaging to Students’ language learning at all! read about that, Crystal rocks! Hey, Giselle! Great to see you around. Giiiiii! You made it! Gr8! We are glad you came, Gi! Great when a student can do this for the teacher. They love it. Yes, Ana, she said it was ok. I presume the teacher needs to have a mobile device for class dojo. http://www.learningfactory.net is now incorporating this into our textbooks for teens! yes, Giselle. The only thing is connection. Depending what you include, you need wifi or 3g to work. 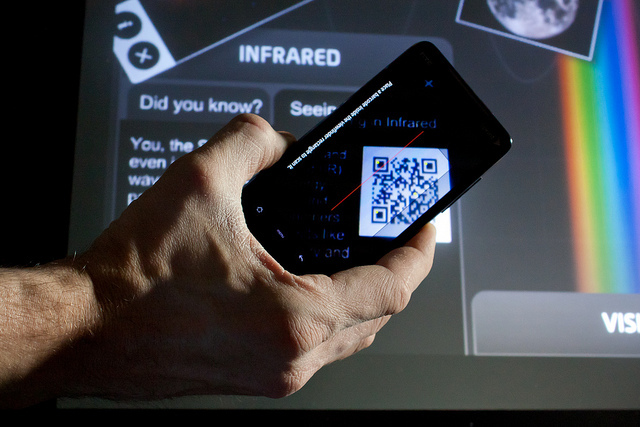 You need a tool to create the qr codes and one to read them. So one code per question, or one for several? you need wifi access all around the school , right? great use of QR code! I’m using that one right now with 9th graders, they work in pairs to collaborate in the story and they liked it a lot. voicethred is a great tool! I just love voice thread! I love VT so much. Used it in my research. never used much technology in class, I am still learning how to do that and most of teachers don’t believe in it in class. Tks Carla, I am afraid to push it and get in trouble. 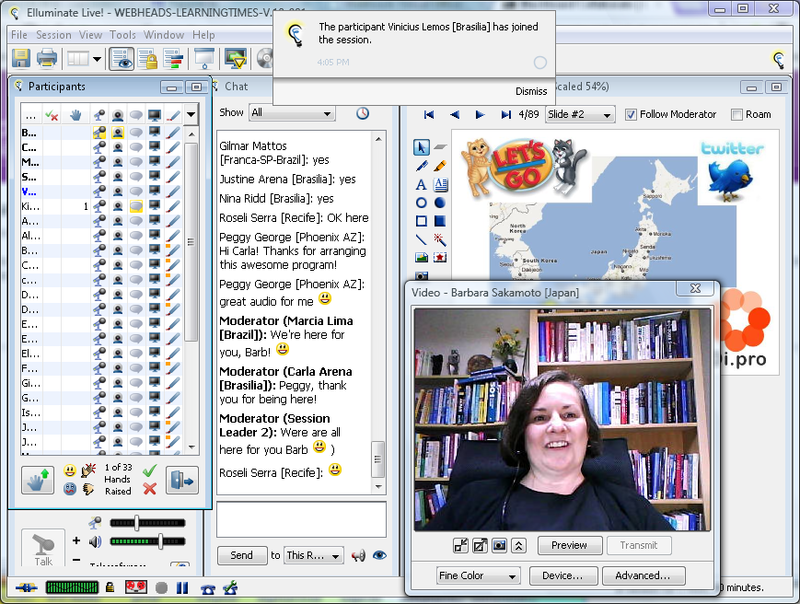 I use it with my online students. But as for the school i owrk for..doesn’t want it..
Also use lino; It’s Great! Wallisher is also a similar tool! I’m going to have to go, Jenny, but I’ll watch the recording later. Sorry. Mommy time! Daughter taking ENEM needs to eat. In our school, we use offline apps. have just learned it is crossplatform, right Carla? Using it from home with Ss’s Wi-fi connectivity. and we need to know about the infrastructure. is socrative available for android phones as well? Can you assume that 100% of your students have access to the technology and internet at home? If even one doesn’t have it that would be a problem for that student. Using it from home with Ss’ Wi-Fi connection. Agreed, Nina. In my classes, they have 100% access. Love Shelly and hers ideas! Her ideas are great, Viníius. I don’t think you can do it unless students ALL have access. if you tip the phone just right can you drink it? Different types of literacy are key for Ss and us. excellent presentation Jennifer! Thank you!!! Amazing, Jen! Clap clap clap!!! Thanks..really interesting site and talk.. So many interesting looking websites to check out. Thank you! 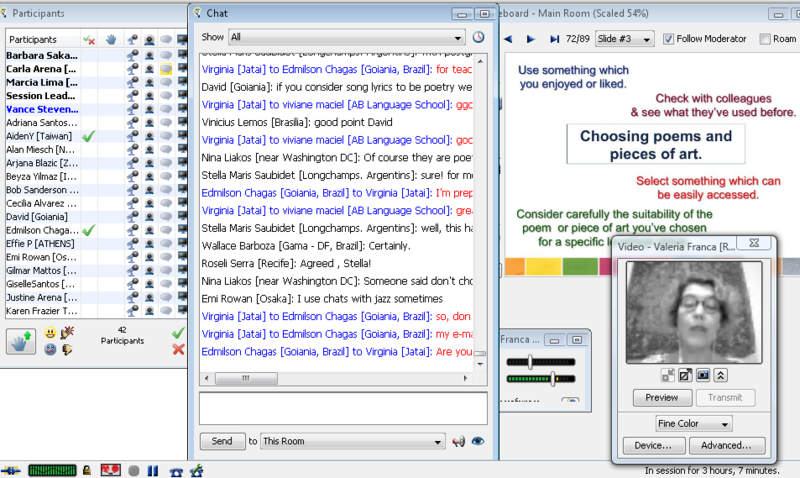 is voicethread only for schools, or privte users? When you say “off line ” use you mean NO connection at all? I’ll add them there, Maria. tks, I was wondering about the great links too. Thank you – Great job! Jennifer, the Cambridge apps that you were talking about, are they different apps? I´e typed ¨ambridge apps¨on the app store and got a bunch of stuff. Justine that is the link. You´e got several tools. Valéia, your voice is gone! she’s a very sweat person! Carla, where shall we get the recording? Let’s all be patient, OK? sure, we know this can happen. I’ll watch the recording version. Thanks for the invitations. Congrats to presenters and organizers! sure! for me lyrics are poetry, too! well, this happens with authentic material. You have to select mat. Yes, the same is true of literature. There is no one right answer. this makes it trully communicative! engaging emotions makes learning much more memorable and long-lasting! I can really see students enjoying this! lots of food for thought in that poem!!! I guess that could be a teaching moment. Nina a lot of teachers do. I stop the class if someone is not following it and wait. We can also weave this to mLearning, what do you say, Viníius? Valeria, what age group(s) do you work with? 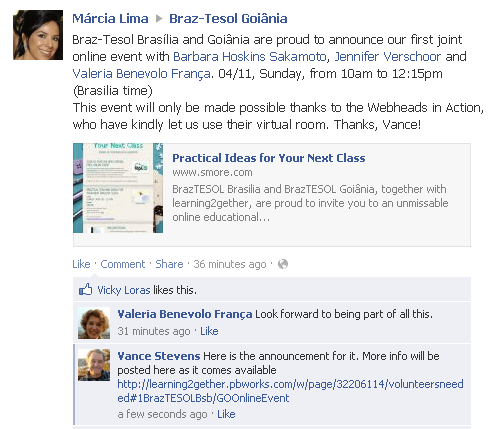 Valeria trains teachers nowadays, Nina, all over Brazil. never had the opportunity to see poems in this way, this sound nice. It’s the same with Jazz Chants (Carolyn Graham)–if the teacher is not totally on board, the students won’t be either. Many ideas are popping in my brain now! learning about many new children’s poets! awesome! Valeria is all about young learners, Peggy! Lovely… if we feel they are getting inspired, in the end can we lead them into creative writing? I couldn’t agree more with you, Carla. there is a great online tool that simulates refrigerator magnets– http://www.piclits.com Create poetry with images using drag and drop or free writing. yes, Nina. that would be great. We should have sessions like these on a weekly basis. They enrich our lessons so much. Yes, it coould be creative writing asking Ss to write poems form ONe word for ex, starting with the first letter of the worrd and so on. Ex Write a poem starting with each letter of the word ELEPHANT. I tried it and it worked very well! I need to read more poems. Nice! i’ll use it with my college students! Do lyrics count as poetry? Someone mentioned that earlier. yes yes yes I COULDN’T AGREE MORE. Yes! And nowadays our SS are much more aware about pintings and artists than before. Schools teach arts nowadays. I totally agree , Valéia! ha, ha. You’re right Nina. I have to go. tks for the great webinar. I’ll watch later the recording. Can you share this video Carla? I love arts, I painted and drew for quite few years. I am so interested in this. it makes art available, plausible and palpable. peanut butter and jam sandwiches in class?! You can’t miss that, guys! tons of inspiring presentations! great idea to link with the previous slides!! In a writer’s workshop, this would work perfectly! Lovely and thank you very much!!! Thank you all for being here! Special thanks to our wonderful presenters and vance. Look forward to using this ideas in my classroom! What an inspiring way to end a Sunday morning! Wonderful ideas to generate memorable lessons! I’m looking forward to using these ideas in my classroom, Valéia. Thank you so much! Carla, you said the sessin was to be recorded. Where can it be found? so happy I could participate in these sessions! every one of them was outstanding!!! looking forward to exploring the links once they are posted!!! Just THANKS for this Webinar! Nice ideas. Thanks for making this dream possible, Vance! Great 🙂 Thank you very much! Thank you so much for such a unique event! I have profited I lot from it! Looking forward to the next one. Thank you, Carla and all. Great job, as always. thank you Carla and all of the presenters! Breakfast time here, Have a good day/night! Sound is gone! THanks you very much1 My pleasure to be hre with you guys! come back to this same room in about 30 minutes 🙂 we’d love to have you! could you type the information? When? WE couldn’t hear you! Blogs use WYSIWYG editors but you can also use HTML if you wish. But you don’t need to know html.